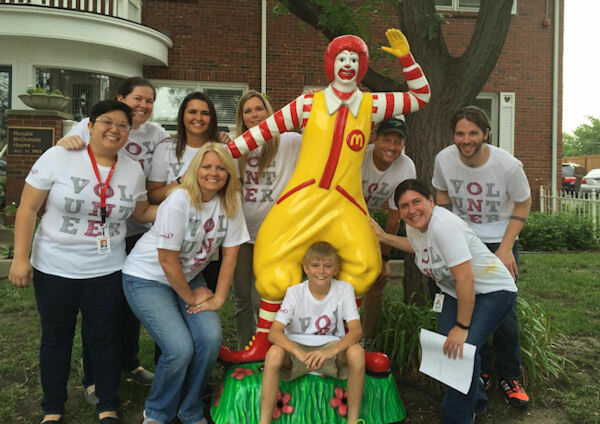 across the Country for "All for 1 Day"
Volunteers from Protection 1's call center in Wichita, Kansas, at the local Ronald McDonald House. 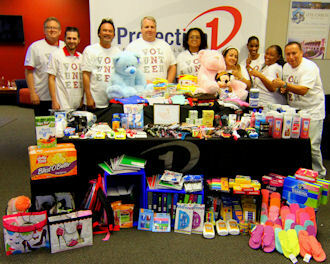 Chicago, IL - Protection 1, the largest full-service business and home security company in the U.S., today announced that it has just completed its third annual "All for 1 Day" where its employees volunteered their time for local causes that will benefit the communities where they live and work. During this year's event, team members from 70 branches across the country donated more than 1,000 hours in support of a wide range of projects benefiting more than 30 organizations and communities. The projects ranged from serving meals at rescue missions, senior centers and local Ronald McDonald's houses to blood, food and clothing drives and community clean-up projects. "For the past three years, our employees have enthusiastically participated in "All for 1 Day" spending their time giving back to the communities where they live," said Timothy J. Whall, Chairman and CEO of Protection 1. "This year we saw quite a bit of activity supporting children's causes. Efforts such as "All for 1 Day" personify our core company values and priorities and we firmly believe that not only do we make a difference in providing safety and security measures to our customers, but we make our communities a better place to live." Protection 1's "All for 1 Day" gives its employees the latitude to choose projects that will make the greatest impact in their areas. Team members from Dallas, Texas took the day to paint rooms at Camp Summit, a premier camp that provides a barrier-free environment for adults and children with disabilities. 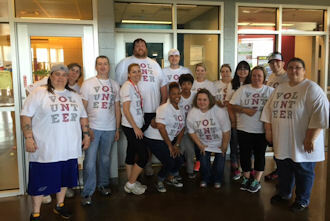 Team members in Birmingham spent the day cleaning up Jessie's Place, a women and children's shelter in that city. In Los Angeles, a food, clothing and essentials drive was held in support of Children of the Night while the Topeka/Lawrence, KS branches held a car wash to raise money for Helping Hands, another not-for-profit that supports families with disabled children. "All for 1 Day" also gives Protection 1 associates a vehicle to work together outside of their office environments and is a great avenue for fostering team building and an enormous sense of pride. (Left) Protection 1 volunteers from the Wichita call center at the Kansas Humane Society. 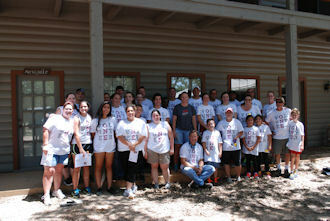 (Right) Dallas team members at Camp Summit, a camp for adults and children with disabilities. 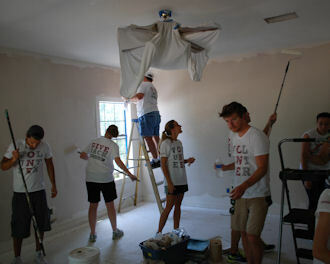 (Left) Protection 1 volunteers painting rooms at Camp Summit. (Right) Protection 1 volunteers at a food, clothing and essentials drive in support of Children of the Night in Los Angeles.